In the simplest cases, when the watermark was located over the relatively uniform area, a modification of histogram curves, that results in changes to contrast and brightness, brings satis- fying watermark readability. 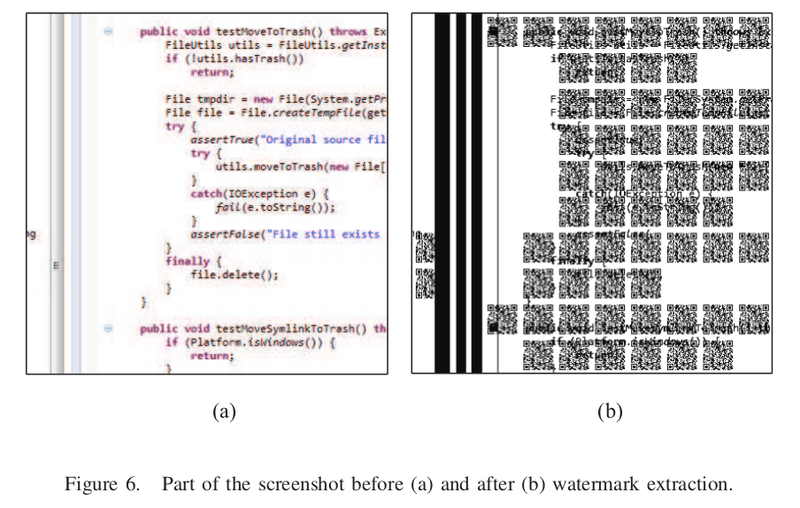 In more complex situations, when the watermark was located over the non-uniform elements, such as colorful pictures, the method allowing to find the watermark is histogram-based image segmentation. They said that extraction part was done using GIMP(I've already tried but failed). The Lena image was embedded with a QR Code. The embedding process is on the Y Channel of the original image and in the extraction process I'm reading the watermarked image as jpeg(colored) and converting to YUV. How can i properly amplify the difference of luminance between pixels of color images? Browse other questions tagged image-processing equalization color histogram or ask your own question. How can I use the fourier transform of a sequence of x-ray scan images to segment it?